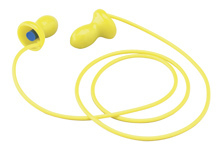 EZ-Ins Reusable Ear Plugs are washable and reusable. The central removable stem is provided as an insertion aid and it is flexible and soft enough to remain comfortably in place. These great little ear plugs fit most people comfortably and their durability makes them a great buy. Excellent Choice for Motorcycle Wear: E-A-R EZ-Ins have no external stem to interfere with your helmet and the NRR 22 is ideal for riding: just enough to reduce the wind noise to a safe level and still let you hear traffic noises you need to hear. E-A-R EZ-Ins Reusable Ear Plugs Corded (NRR 22)5B GonzalesOctober 4, 2016I love them! Wear every day for 10 hours, very comfortable! E-A-R EZ-Ins Reusable Ear Plugs Corded (NRR 22)2Miss KarenDecember 26, 2011I ordered several E-A-R-EZ-In earplugsfor the lunch moms I work with in an elementary school. Sorry, but 200 lunching fourth, fifth and sixth graders are louder, apparently, than a motorcycle, which this product was recommended for. Maybe it is time to call OSHA in for an evaluation of the decibel level in our cafeteria. Perhaps they can tell us what type of hearing protection we need.